Tanya Walker wanted to become a successful Bay Street lawyer. She knew a DeGroote Commerce degree would help get her there. Walker is known around the courts and boardrooms of Toronto as one of the most tenacious lawyers in the city. 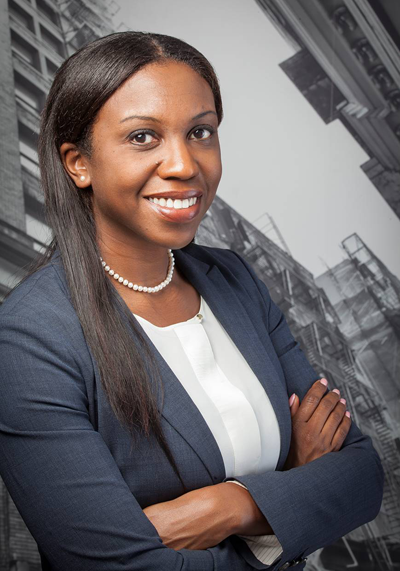 In addition to being the head of her own firm, Walker Law, which specializes in commercial litigation, she’s also the first elected black female bencher from Toronto and one of the youngest elected members of the Law Society of Upper Canada. She’s an active member of the Canadian Association of Black Lawyers; the Supreme Court of Canada Liaison Committee; and the Board of Directors of the Osgoode Hall Law School Alumni Association. Fourteen years ago, you were finishing a Commerce degree at the DeGroote School of Business. Now, you’re the head of an award-winning Toronto law firm. Are you right where you want to be at this stage in your career? That’s difficult to answer, because I didn’t think I would end up owning a law firm. However, I’ve always wanted to be a lawyer, and I’ve always wanted to be an advocate for my clients. So in that sense, yes, I’m right where I want to be in terms of the work I’m able to do right now. I am where I envisioned myself. What was the greatest takeaway or lesson you learned during your time at DeGroote? There were so many things. It was so collegial at DeGroote. The world of business is very competitive and can be very cutthroat. But I found my classmates to be so collegial. We studied together, worked on projects together, built relationships with our professors. That’s another thing, the faculty were wonderful. Milena Head in particular is fabulous. I actually started taking IT classes because I enjoyed learning from Milena so much. I could always tell she’s passionate about what she does, and she genuinely wants to help her students. Another big part of my student experience at DeGroote was my internship at Celestica. I did a 16-month placement, which really gave me the benefit of being immersed in a work environment and learning as much as I could. Can you describe the connection between studying business and succeeding as a lawyer? With a business degree, you learn to think a certain way. We know there are lawyers out there who don’t practice law. They’re politicians, for example. You can be a wonderful lawyer, but if you don’t have any clients it’s hard to do what you love. If you’re not able to generate new business, manage expenses, and effectively market yourself and your firm, you may be in a lot of trouble. Marketing is so important. You have to make sure people remember who you are. Also, quite often, in a pre-trial hearing you’ll come to a settlement based on what makes sense from a business perspective. A great thing about having a business degree is that it forces you to maintain a realistic outlook, for yourself and your clients. Nothing comes easy or quickly. You have to put in the time and the work. You have to have endurance and grit. You earned your law degree from Osgoode in 2005 and opened your own firm not long afterward in Canada’s largest city – what prompted you to make such a bold move so early in your career? I always knew what I wanted to do, and I always paid attention to what you have to do to become successful. The people that usually end of being very successful are those who start their businesses at a young age. You have a lot more energy when you’re a little bit younger and usually you have less responsibilities, so you’re able to take more risks. I originally practiced at two Bay Street firms, and then the opportunity came up to share space with a firm in Toronto and I thought, “what’s the harm?” I wanted to have my own client base and I needed mentors, so it was a really good fit. We finally moved about a year and a half ago out of that space, because we just kept hiring people and growing the firm. Tell us a little about what you do at Walker Law – what does a typical work day entail? If I’m preparing for trial, I usually arrive at work between 6:30 and 7 a.m. I like coming in at that time, because I have two solid hours to work before my phone really starts ringing and my staff arrives at the office. I often prepare submissions, read case work, and decide what we need to do that day. In truth, my work day kind of starts the night before. Before I go to bed, I look at my “to do” list to see what needs to be accomplished the following day. The thing about litigation is that issues just fall in your lap. People bring motions, you settle things, you meet with clients after-hours or on the weekend, it can be sporadic at times. If I’m not in a trial, I usually try to go to the gym in the morning before coming to the office. Being a healthy person has a direct correlation to having a healthy mind. You were recently elected by your peers as the first black female elected bencher from Toronto at the Law Society of Upper Canada, and you’re also one of the youngest sitting benchers. What does that honour mean to you, on a personal level? It means so much to me. I really feel fortunate and honoured, because we’re elected to this role. I received, I think, around 2,800 votes, and only lawyers can vote for you. Now that I’m in this position, I take it very seriously. It means a lot to be seated at that table; to be able to express my views. Only benchers can actually say something. The other people sitting in the room can only observe. I’m fulfilling my purpose, which is to do what I can to make things easier for everyone – not just minorities, but also younger lawyers and women. That’s what I’m here to do. What advice would you give to DeGroote students who are approaching graduation and eager to make their mark? You just have to be patient. You may want to make a mark immediately and see your name on awards, but these things often take time. I’m a believer in Malcolm Gladwell’s famous quote: “ten thousand hours is the magic number of greatness.” Nothing comes easy or quickly. You have to put in the time and the work. You have to have endurance and grit. Also, the way you present yourself and the way you act – even during university – that follows you throughout your life. Some of the relationships I formed at DeGroote ended up leading to great referrals later in my career. I was always thinking about my brand and asking, “what do I want people to say when they hear the name Tanya Walker?” The little details matter.